I recently noticed that my favorite brew pub has a VEGGIE burger on its menu. Yes, we have shifted a bit when it comes to our burger consumption. We can try turkey, soy, veggie, etc. and still have a "burger". 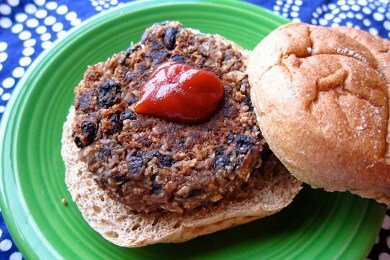 I have been searching for a way to make my own non-meat burger ever since I featured a Lentil Chipotle Burger from a vegan chef. My problem with that recipe is that it took ALL DAY. I had to cook the beans, saute the veggies, use my food processor, and then fry up the delicious results. It was worth it - but I don't have that kind of time on my hands. Many other recipes for veggie burgers include eggs to hold the burger together. Since this is a non-meat item, I think it doesn't make sense to make with eggs. Why not just go vegan if you are going to skip the meat? I decided to use canned black beans, skip the veggies, and see what I got. I made a "black bean oat burger" which tastes really good and is almost as fast as making a regular "red meat" burger. Let's be clear, this is not a replacement for a COW meat burger. This is its own lovely thing that can be eating for breakfast, lunch, or dinner and served plain, in a tortilla, or on a bun. The key to making these burgers go from mediocre to delicious is you! If you like your food bland - don't add anything. If you like spice try chili powder, curry powder, salt, ground cumin, etc. If you don't have instant oats in your house, pulse your whole oats in your food processor for about 10 seconds or until they are a bit ground up. The whole oats will be too tough to chew in the burger. Finally, if you can get your hands on gluten-free oats - these burgers are both vegan and gluten-free! Hurray! Do you make your own "veggie" burger? I am yet to try a veggie burger, but I do plan on giving them a try out! This recipe looks great, but how does everything stick together to make a patty? If you don't have instant oats, take regular oats and put them in the blender or food processor until they are fine. Instant oats are just regular oats that have been cut up finer. @Jennifer - so it just sticks - there is enough liquid and oats for it to form a patty. The hummus (with its tahini) stick it together. I just want to add that these were great RIGHT after I made them. They were a big soggy the next day - they lost their crunch in the fridge. These are incredibly similar to my veggie burgers, except I use barbecue sauce instead of hummus...Snack Girl, do you have a camera in my kitchen? Ooh, that looks and sounds great! I'm a big fan of Morningstar Farms' spicy black bean burger (despite some not so 'pure' ingredients and slightly oily exterior - though it's nothing a few dabs with a paper towel can't handle; but hey, they're a good treat every so often) and this seems like a similar thing. I'd love to make these because they'd be cheaper and just a little more wholesome than MF's. Any advice for substituting hummus? I like it but my digestion doesn't. Maybe white bean dip? This looks great and oats and beans are great for you! Looks great! I'm going to mix in some okara and I think this will be great. To the person who can't digest hummus--how about guacamole? I like to use rice in veggie burgers to give it a good texture. Instant oats might be good too! These sound great and my favorite...easy to make!I like the convenience of Morning Star but not all the extra ingredients. I'm definitely going to try these! Thanks for this recipe! I made these with old fashioned rolled oats (all I ever have in the house) & made them the night before...let the mixture sit overnight in the fridge...which softened the rolled oats & they were great! 3 basic ingredients & then the mix-ins possibilities are endless...thanks so much for this! I like the use of hummus. Great idea! Hi!...Could you tell me where I can find hummus?...Thanks in advance! Hummus is in the grocery store - usually near the salsas or cheeses (look for dips). Great question! I made these "bean burgers" and they were delish!!! I had homemade hummus (without oil) and used steel cut oats! Served them with fresh salsa and brown rice. Thank you for the recipe! It promptly found a home in my "faves" section of the recipe box! I eat meat but love vgigee meals and vgigee burgers. I also favor the Morningstar black bean burger and Amy's burgers. Can even get the husband to eat them. Love the grilling tips! Would quinoa work here instead of the oats? I Wouldnlove to use quinoa in a different way than just the usual salad or plain side. Thoughts?